Exporter of a wide range of products which include automatic chirag next gen block machine, fully automatic chirag next gen block machines, semi automatic chirag next gen block machines, multifunction chirag next gen block machines, multi raw material chirag next gen block machines and chirag next gen block machine. 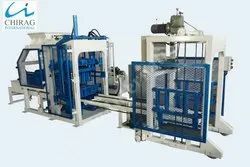 The Automatic Chirag Next Gen Block Machine forming machine is newly developed by our company, is a special equipment for producing building blocks. The machine can use fly ash, slag, coal gangue or other industrial waste residue and river sand, gravel, cement and other materials to produce hollow blocks, perforated bricks, curbs, pavers and grasses of various specifications by changing the mould. Concrete products such as bricks, ring tree bricks, and slope protection bricks. Plus fabric fabrics can also produce layered products. The main frame of Automatic Chirag Next Gen Block Machine forming machine adopts detachable vertical double frame structure, which is made of super large and strong steel. It is strong and vibration resistant and has good reliability. It adopts indenter and stripping double clamping method to ensure reliable movement of product removal and swaying. The structure, the fabric is fast and uniform, the product strength error is very small, the stability is high, and the scrap rate is low. The Fully Automatic Chirag Next Gen Block Machines forming machine is newly developed by our company, is a special equipment for producing building blocks. The machine can use fly ash, slag, coal gangue or other industrial waste residue and river sand, gravel, cement and other materials to produce hollow blocks, perforated bricks, curbs, pavers and grasses of various specifications by changing the mould. Concrete products such as bricks, ring tree bricks, and slope protection bricks. Plus fabric fabrics can also produce layered products. The main frame of Fully Automatic Chirag Next Gen Block Machines forming machine adopts detachable vertical double frame structure, which is made of super large and strong steel. It is strong and vibration resistant and has good reliability. It adopts indenter and stripping double clamping method to ensure reliable movement of product removal and swaying. The structure, the fabric is fast and uniform, the product strength error is very small, the stability is high, and the scrap rate is low. The Semi Automatic Chirag Next Gen Block Machines forming machine is newly developed by our company, is a special equipment for producing building blocks. The machine can use fly ash, slag, coal gangue or other industrial waste residue and river sand, gravel, cement and other materials to produce hollow blocks, perforated bricks, curbs, pavers and grasses of various specifications by changing the mould. Concrete products such as bricks, ring tree bricks, and slope protection bricks. Plus fabric fabrics can also produce layered products. The main frame of Semi Automatic Chirag Next Gen Block Machines forming machine adopts detachable vertical double frame structure, which is made of super large and strong steel. It is strong and vibration resistant and has good reliability. It adopts indenter and stripping double clamping method to ensure reliable movement of product removal and swaying. The structure, the fabric is fast and uniform, the product strength error is very small, the stability is high, and the scrap rate is low. The Multifunction Chirag Next Gen Block Machines forming machine is newly developed by our company, is a special equipment for producing building blocks. The machine can use fly ash, slag, coal gangue or other industrial waste residue and river sand, gravel, cement and other materials to produce hollow blocks, perforated bricks, curbs, pavers and grasses of various specifications by changing the mould. Concrete products such as bricks, ring tree bricks, and slope protection bricks. Plus fabric fabrics can also produce layered products. The main frame of Multifunction Chirag Next Gen Block Machines forming machine adopts detachable vertical double frame structure, which is made of super large and strong steel. It is strong and vibration resistant and has good reliability. It adopts indenter and stripping double clamping method to ensure reliable movement of product removal and swaying. The structure, the fabric is fast and uniform, the product strength error is very small, the stability is high, and the scrap rate is low. The Multi Raw Material Chirag Next Gen Block Machines forming machine is newly developed by our company, is a special equipment for producing building blocks. The machine can use fly ash, slag, coal gangue or other industrial waste residue and river sand, gravel, cement and other materials to produce hollow blocks, perforated bricks, curbs, pavers and grasses of various specifications by changing the mould. Concrete products such as bricks, ring tree bricks, and slope protection bricks. Plus fabric fabrics can also produce layered products. The main frame of Multi Raw Material Chirag Next Gen Block Machines forming machine adopts detachable vertical double frame structure, which is made of super large and strong steel. It is strong and vibration resistant and has good reliability. It adopts indenter and stripping double clamping method to ensure reliable movement of product removal and swaying. The structure, the fabric is fast and uniform, the product strength error is very small, the stability is high, and the scrap rate is low. The Chirag Next Gen Block Machine forming machine is newly developed by our company, is a special equipment for producing building blocks. The machine can use fly ash, slag, coal gangue or other industrial waste residue and river sand, gravel, cement and other materials to produce hollow blocks, perforated bricks, curbs, pavers and grasses of various specifications by changing the mould. Concrete products such as bricks, ring tree bricks, and slope protection bricks. Plus fabric fabrics can also produce layered products. The main frame of Chirag Next Gen Block Machine forming machine adopts detachable vertical double frame structure, which is made of super large and strong steel. It is strong and vibration resistant and has good reliability. It adopts indenter and stripping double clamping method to ensure reliable movement of product removal and swaying. The structure, the fabric is fast and uniform, the product strength error is very small, the stability is high, and the scrap rate is low. The Chirag Multi Speed Block Machines forming machine is newly developed by our company, is a special equipment for producing building blocks. The machine can use fly ash, slag, coal gangue or other industrial waste residue and river sand, gravel, cement and other materials to produce hollow blocks, perforated bricks, curbs, pavers and grasses of various specifications by changing the mould. Concrete products such as bricks, ring tree bricks, and slope protection bricks. Plus fabric fabrics can also produce layered products. The main frame of Chirag Multi Speed Block Machines forming machine adopts detachable vertical double frame structure, which is made of super large and strong steel. It is strong and vibration resistant and has good reliability. It adopts indenter and stripping double clamping method to ensure reliable movement of product removal and swaying. The structure, the fabric is fast and uniform, the product strength error is very small, the stability is high, and the scrap rate is low. 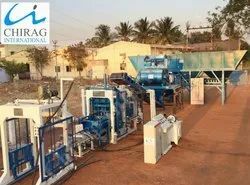 The Chirag Eco Friendly Block Machines forming machine is newly developed by our company, is a special equipment for producing building blocks. The machine can use fly ash, slag, coal gangue or other industrial waste residue and river sand, gravel, cement and other materials to produce hollow blocks, perforated bricks, curbs, pavers and grasses of various specifications by changing the mould. Concrete products such as bricks, ring tree bricks, and slope protection bricks. Plus fabric fabrics can also produce layered products. The main frame of Chirag Eco Friendly Block Machines forming machine adopts detachable vertical double frame structure, which is made of super large and strong steel. It is strong and vibration resistant and has good reliability. It adopts indenter and stripping double clamping method to ensure reliable movement of product removal and swaying. The structure, the fabric is fast and uniform, the product strength error is very small, the stability is high, and the scrap rate is low. 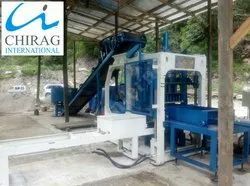 The Chirag Latest Quality Block Machines forming machine is newly developed by our company, is a special equipment for producing building blocks. The machine can use fly ash, slag, coal gangue or other industrial waste residue and river sand, gravel, cement and other materials to produce hollow blocks, perforated bricks, curbs, pavers and grasses of various specifications by changing the mould. Concrete products such as bricks, ring tree bricks, and slope protection bricks. Plus fabric fabrics can also produce layered products. The main frame of Chirag Latest Quality Block Machines forming machine adopts detachable vertical double frame structure, which is made of super large and strong steel. It is strong and vibration resistant and has good reliability. It adopts indenter and stripping double clamping method to ensure reliable movement of product removal and swaying. The structure, the fabric is fast and uniform, the product strength error is very small, the stability is high, and the scrap rate is low. TheChirag powerful Technology Block Machines forming machine is newly developed by our company, is a special equipment for producing building blocks. The machine can use fly ash, slag, coal gangue or other industrial waste residue and river sand, gravel, cement and other materials to produce hollow blocks, perforated bricks, curbs, pavers and grasses of various specifications by changing the mould. Concrete products such as bricks, ring tree bricks, and slope protection bricks. Plus fabric fabrics can also produce layered products. The main frame of Chirag powerful Technology Block Machines forming machine adopts detachable vertical double frame structure, which is made of super large and strong steel. It is strong and vibration resistant and has good reliability. It adopts indenter and stripping double clamping method to ensure reliable movement of product removal and swaying. The structure, the fabric is fast and uniform, the product strength error is very small, the stability is high, and the scrap rate is low.